Thrilled to be part of this next month, curated by Brisbane artist run spaces. Join Bianca Gannon and Ida Lawrence on an adventure through the music, art and food traditions of our nearest neighbours – Indonesia. As you journey through The Sound of Shadows you will play and wear endangered food-related musical instruments such as the duck herders’ Bundengan, interact with traditional shadow puppets and sample delicious Indonesian food! Whistling while you work and providing food for thought, this immersive farm to table experience engages the next generation of leaders in the future of these unique traditions and the future of our food. ArtPlay’s New Ideas Lab supports artists and children to work together to develop new arts experiences. Age group: 6-10 year olds. At this year’s ASYIK, I am running a workshop called About Batik and participating in the artist talks. ASYIK CASULA: Indonesian Cultural Day is an asyik day of activities for all ages (asyik meaning “fun!” and “enjoy!” in Indonesian slang). The day includes art workshops, dance and Acehnese body percussion workshops with Suara Indonesia Dance and performances by Sydney’s Indonesian community. The day concludes with a conversation with artists involved in the looking here looking north exhibition and a performance by Kartika Suharto-Martin. Indonesian food, traditional drinks and crafts will be available to purchase on the day(please bring cash). Bellbird Dining & Bar will also be open. So looking forward to exhibiting some new (big!) narrative paintings of my experiences in Indonesia at Casula Powerhouse alongside my Wovens — Alfira O’Sullivan, Bridie Gillman,Kartika Suharto-Martin, Mashara Wachjudy, Sofiyah Ruqayah and Leyla Stevens (exhibition essay). looking here looking north is an exhibition by Woven, a collective of artists who each have continuing personal ties to Indonesia. 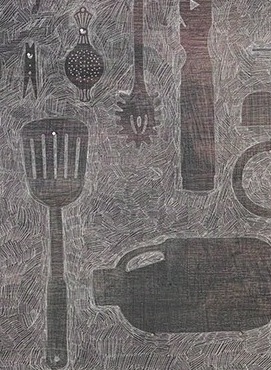 Drawing on lived cross-cultural experiences, memories and observations in Indonesia and Australia, the artists’ works explore connections to family, place and culture, both familiar and unfamiliar. 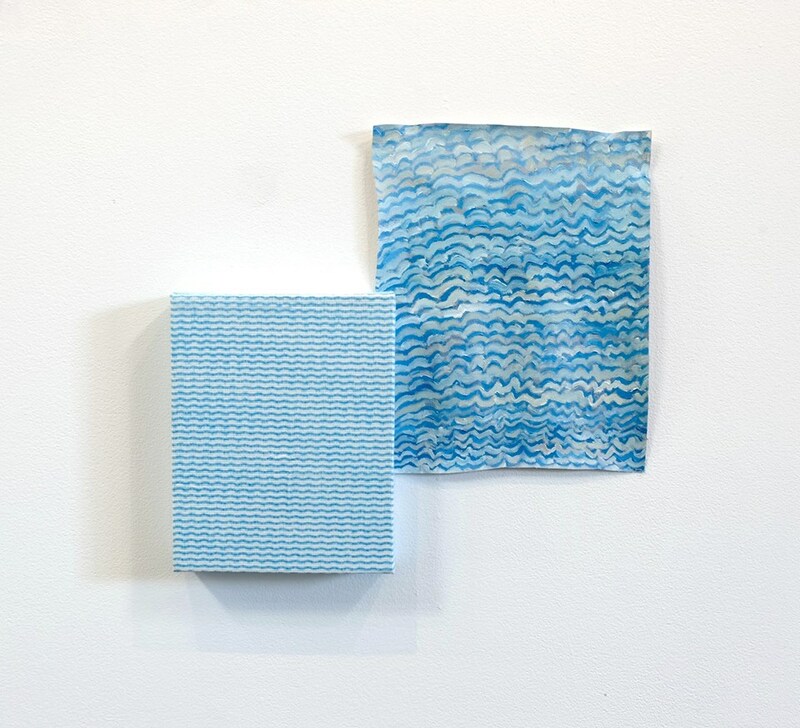 For some of the artists, their creative process provides an opportunity to strengthen these connections; for others, the work itself is a place to reflect on feelings of ‘between-ness’ or cultural and geographic disconnect. Other works share poetic and humorous responses to the complex and sometimes surprising realities of contemporary Indonesia, including Bali’s tourism hubs. In this exhibition, the artists express these stories, observations, meditations and imagined possibilities through performance, painting, installation, photography and video. looking here looking north is presented as part of a suite of exhibitions showcasing perspectives on Indonesia along with intricately stitched quilts by Frances Larder exploring Indonesia’s colonial past and an exhibition of video works of characters and scenes by Jumaadi (one of my fave contemporary artists!) drawing on Indonesian shadow puppetry traditions to connect people, places, time, history, memory and nature. 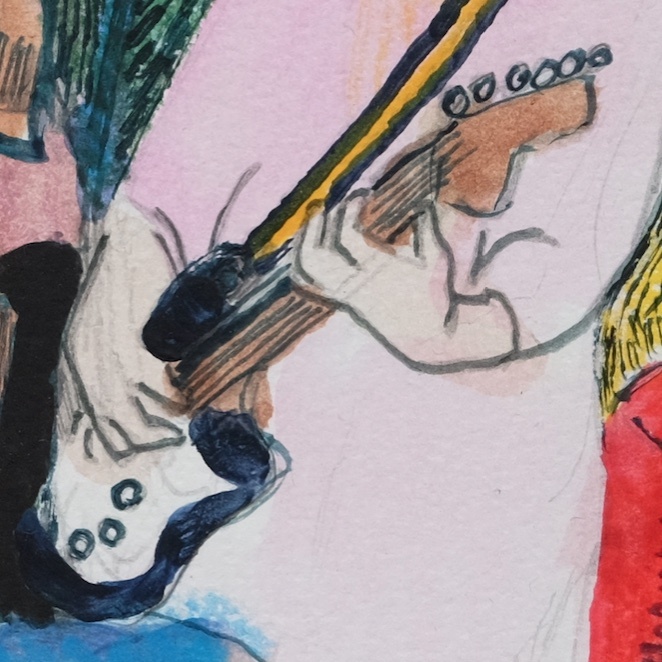 Chuffed to have completed some illustrations for Bonniesongs’ EP Strings. This is my second project with Bonniesongs, after our stop motion animation collab. How’s this for a bargain – spend $15 and receive THREE of my artworks (printed on the EP cover, back cover and CD) AND over TWENTY-FOUR minutes of wondrous sounds! Very happy to have been a body in one of Alexandra Spence‘s Scores for bodies and/in time, which she is exhibiting in the group show Score Club | Club Score at firstdraft. 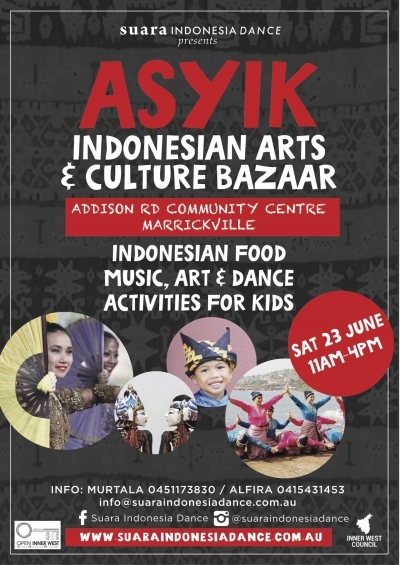 I am excited to be showing works alongside beauties by other Australian-Indonesian artists in this year’s ASYIK Indonesian art and culture bazaar! It’s a day of food, dance, art, craft and kids activities. Ayo datang ya! Thank you Dwi S. Wibowo for sharing your thoughts about my solo exhibition at Redbase Foundation! 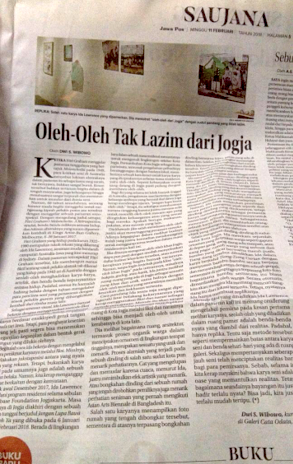 Thanks Haris Firdaus and Kompas for the review of my exhibition Jangan Lupa Bawa Oleh-Oleh Ya! Very excited to begin a residency with Redbase Foundation in Yogyakarta, Indonesia! Home Alone 1: Solitary Pleasures explores everyday individual domestic life as a key space of contemporary art in terms of experience, materials and conceptual reflection. It does so by enlarging aesthetically on the familiar and homely objects of the everyday, and their use in daily rituals around upkeep of the body and the home. The late MILS Gallery (2009-2016) launched (catapult and all!) a book which features my two passions: art and admin. 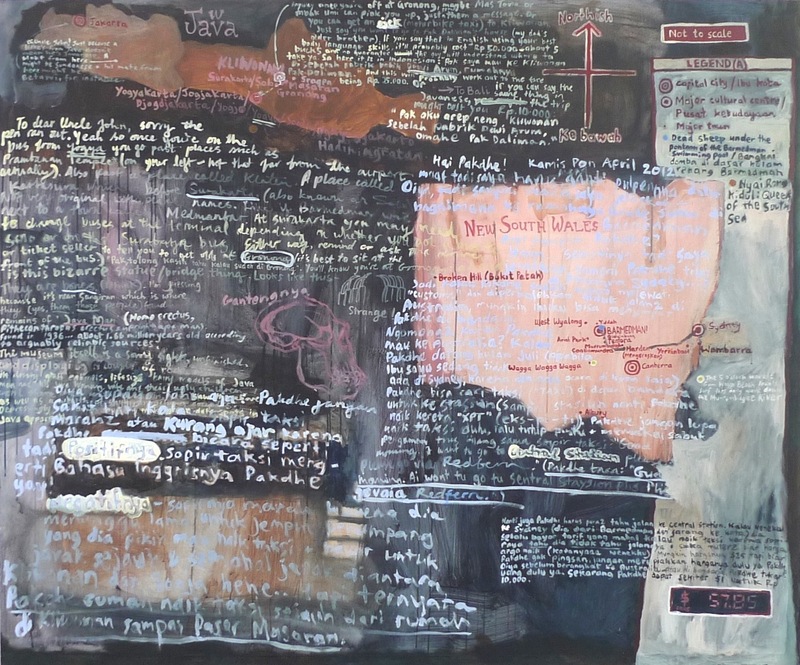 The Fitri Graham Foundation and KINGS Artist-Run proudly present the first retrospective of Australia’s least celebrated artist, Fitri Graham. This survey honours the life, oeuvre and cultural legacy of Graham – a legacy which has not only shaped the visual arts as we know it today, but, as this exhibition reveals, one which has coloured so many of our memories. Fitri Jane Graham (1922-1980) was an abstract painter whose exhibition Melancholia (1949) was ill-received by just about everyone. Art critics described it as “dismal”, “lifeless” and “depressingly bad”; the public was overwhelmingly underwhelmed; and Graham’s own mother suddenly, and without discussion, moved cities two days after the exhibition’s opening. Haunted by her exhibition’s “failure”, Graham never touched a paintbrush again. However, Melancholia hadn’t been as unappreciated as Graham had perceived – imitations began appearing in the backgrounds of school, family and graduation portrait photography and, by the 1970s, had become the dominant backdrop. Realising this, Graham took legal action in 1974 against fourteen photography companies including Rise ‘n’ Smiles and Cherished Memories Photo Studio. Devastatingly, Graham lost. 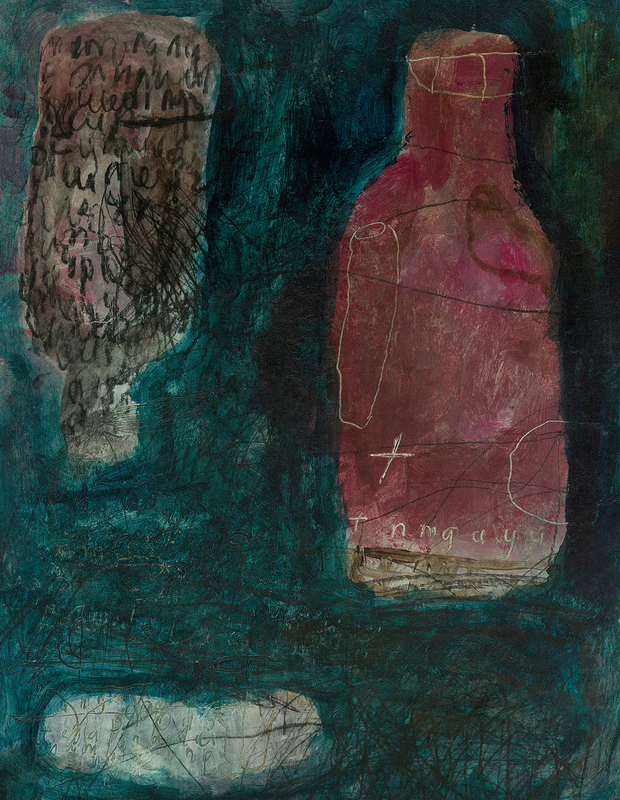 To do Graham and her story justice, this long awaited retrospective features many of the original Melancholia watercolour studies and oil paintings, notably Melancholia IV, recently rediscovered down the back of a rental property pantry. Also on view are archives and artefacts from private collections and the Fitri Graham Foundation (and Estate) including exhibition reviews from 1949 and Graham’s belongings and diaries. 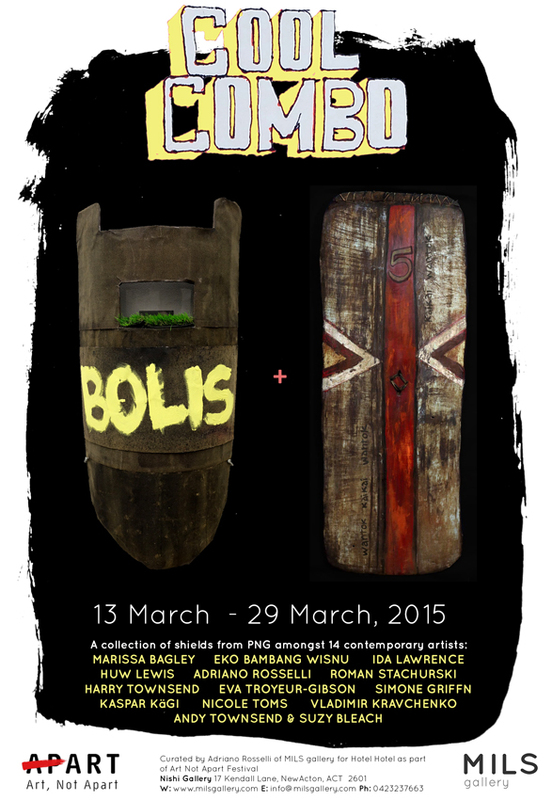 Solo exhibition curated by Jane Gillespie, Sebastian Henry-Jones, Harriet Reid and An Sheng. Last year my relatives contacted Christie’s in hope they would auction our family heirlooms. Disappointingly, Christie’s was unavailable and the fire sale we had instead did not yield enough to fund our bi-annual family holiday to Albury-Wodonga (planned for November 2016). It’s not too late to support this excellent cause – The Heirlooms will be on display and for sale again soon! Solo exhibition of work I first attempted in Japan to be shown in Adelaide! Another first! 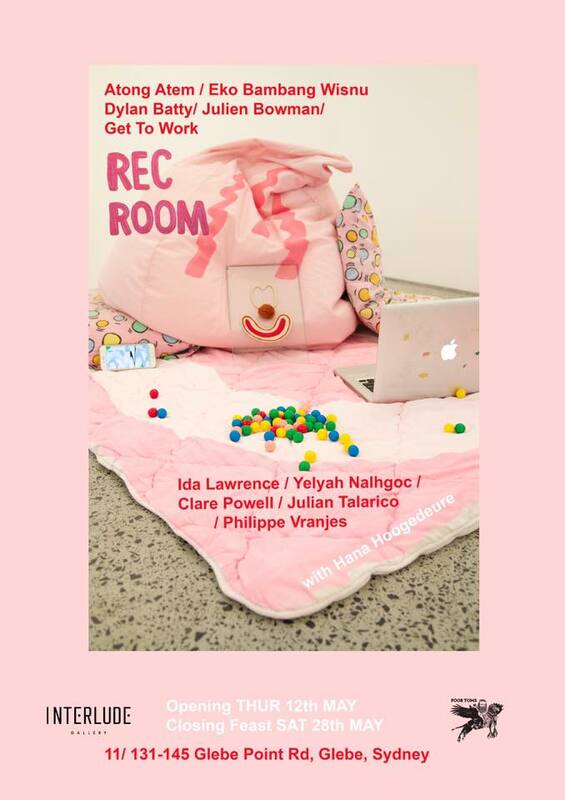 I will have some paintings based on board games, dart boards and sports fields in this group show curated by Hana Hoogedeure. Come play! the shower curtain (Motif #7) — and the paintings, it is said, that inspired them. Been working with Bonnie Stewart on a stop motion video clip for Bonniesongs’ Dinogon. To be released into the wild/Surry Hills on 1 April! 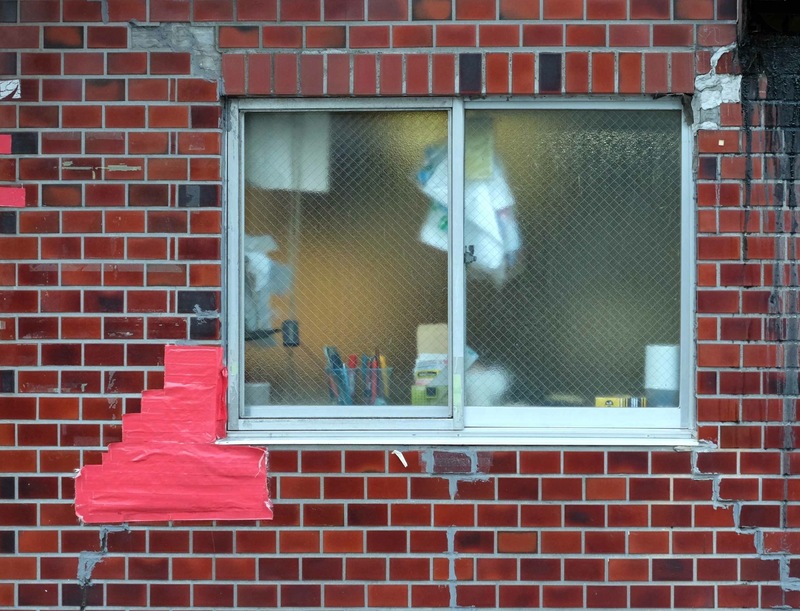 An exhibition of observations and imaginings from my trip to Japan and residency at Sapporo Tenjinyama Art Studio. 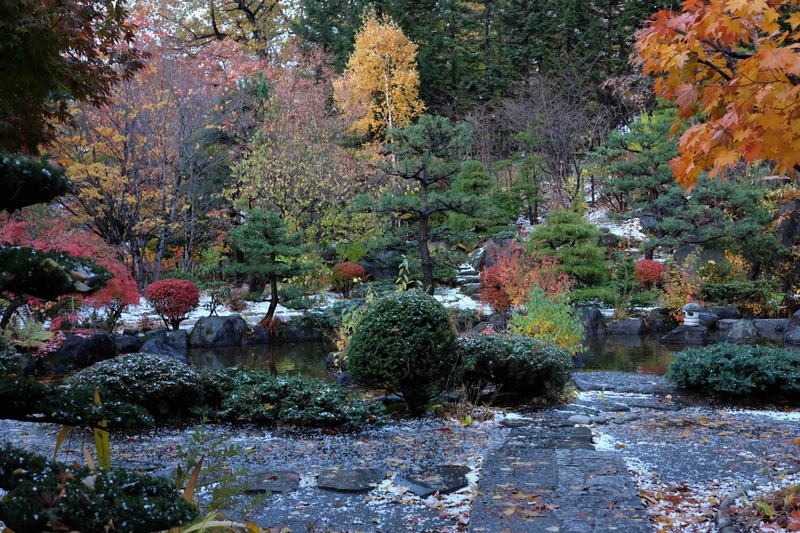 I have lots of woollen things ready for this one month residency in Tenjinyama Park, in Sapporo, Hokkaido, Japan. Yay! I have collaborated with Hana Hoogedeure on a work for MILS Gallery’s annual exhibition of masks, Headgear. 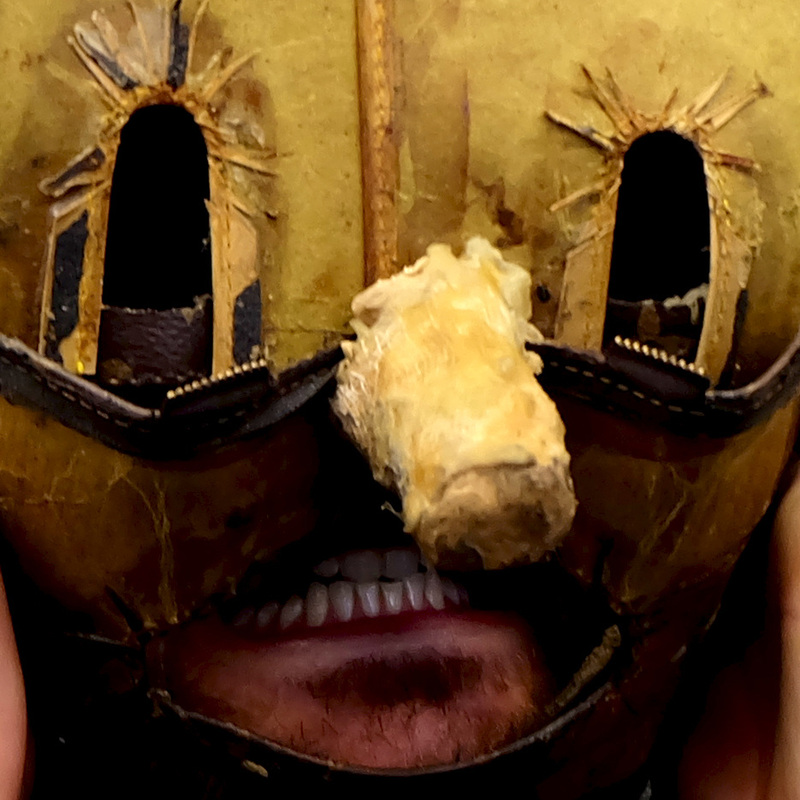 This year the masked characters are from Macbeth – don’t miss the performances on opening night! 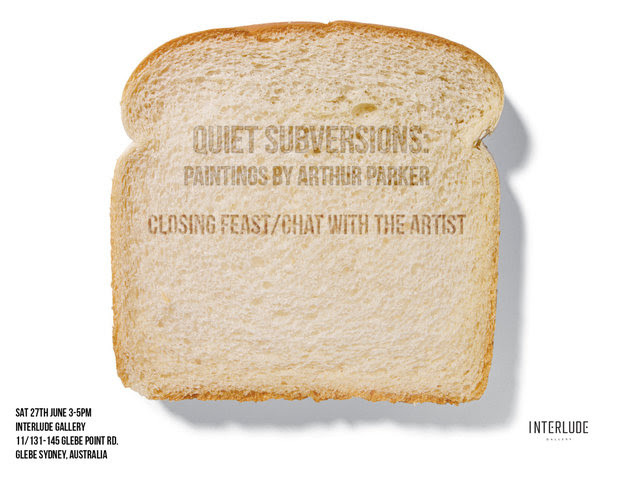 In celebration of a successful exhibition, Arthur Parker will be cooking afternoon tea for patrons, critics, friends, relatives, neighbours, former colleagues and other guests. Everyone is welcome! Arthur will be serving a traditional hi-vis meal: sausage and tomato sauce on white bread, with cake to cleanse the palate. Interlude Gallery will be kindly catering for vegetarians and people who appreciate nutrients in their diet. 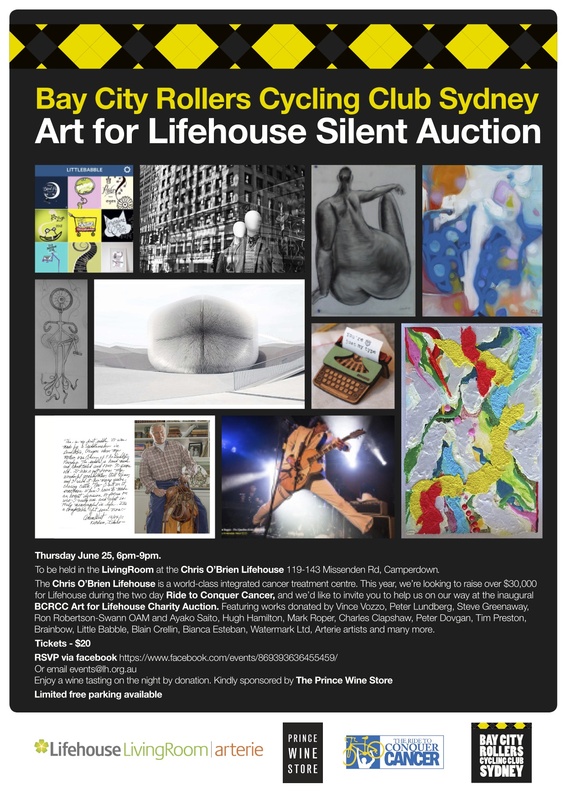 It is a pleasure to be a part of this fundraiser for The Chris O’Brien Lifehouse, a world-class integrated cancer treatment centre. I have donated a work, Sukajadi IV for the silent auction. Looking forward to this event, hope to see you there! 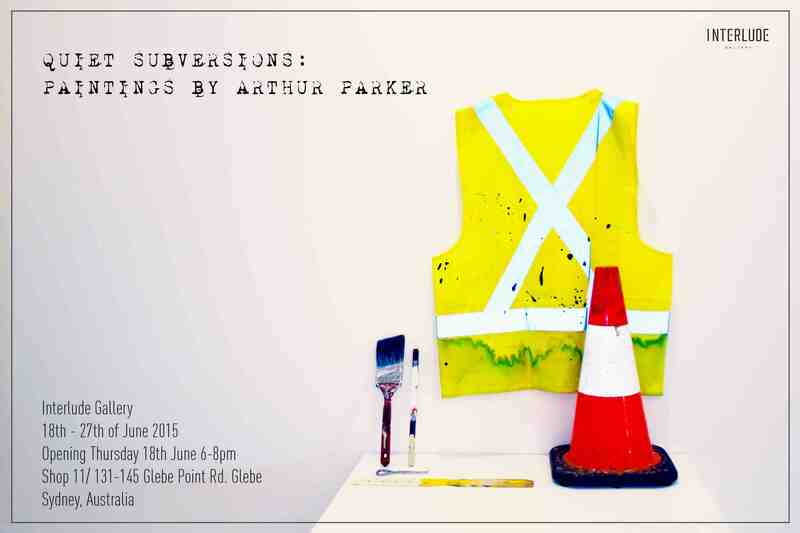 This fascinating retrospective showcases the oeuvre of self-taught Sydney artist, Arthur Parker. Parker began his career as a house painter, went on to contractual graffiti-buffing work for the council, then, after an epiphany, turned his focus to the visual arts. This exhibition features select documentation of Parker’s early site-specific paintings, and recent developments of his current passion: still life painting. Recently, it became necessary that I gather together the family heirlooms. 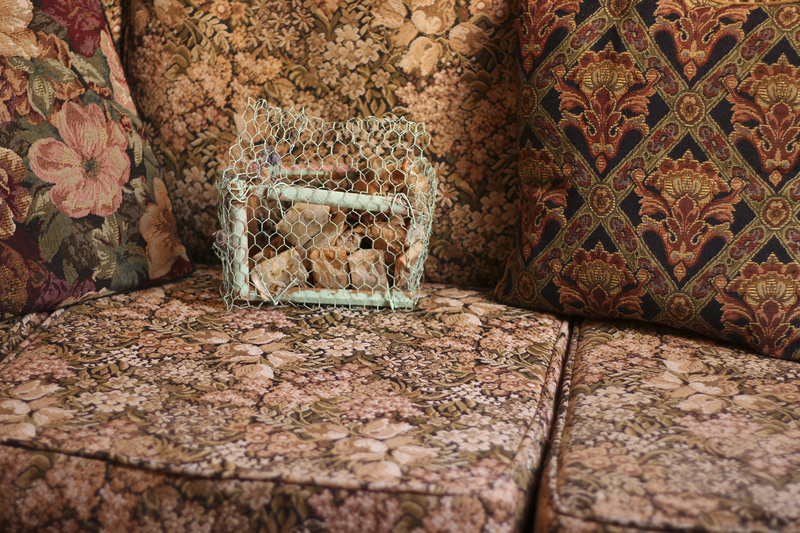 At different times, these precious objects belonged to my great-grandmother Ethel, Third-Cousin-Twice-Removed Frank, Uncle Derek and, scandalously, Aunty Marjorie. Please note all items are for sale. Proceeds go towards the Lawrence family’s 2016 holiday fund to Albury-Wodonga, and the purchasing of a new cheese grater and wireless. Young artist-archeologists (ages 8-12) are invited to join artist Ida Lawrence, on a creative ‘archeological dig’ of Leichhardt Town Hall. 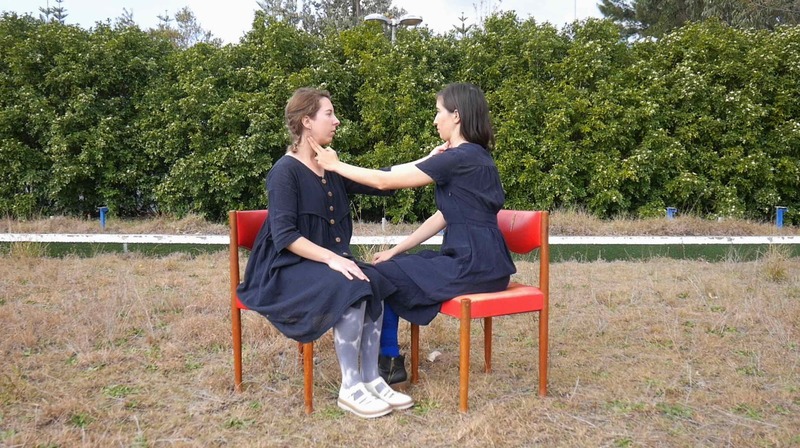 Ida is one of Leichhardt Council’s four Artists in Residence, and will lead participants on a playful sculpture and storytelling workshop: participants will ‘discover’ (ie. 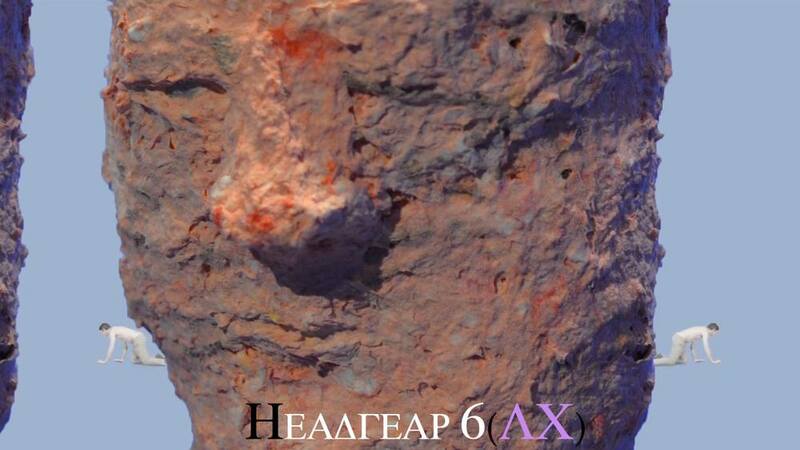 create) imaginative sculptural ‘artefacts’ and reveal their curious functions and histories. To Book: Contact Ida on ida.r.lawrence@gmail.com by Monday 1 June. Arthur Parker and I have paintings in this art exhibition/performance night. 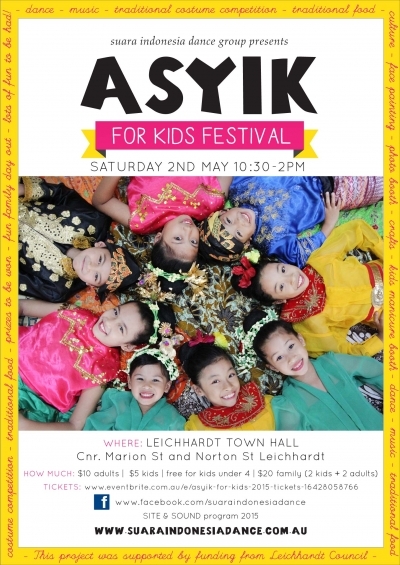 Come to Leichhardt Town Hall this Saturday for a celebration of Indonesia’s arts and cultures. It’s being put on by Suara Indonesia Dance Group, who I’ve had the pleasure of dancing with since 2008. It will be colourful, sequinned, tasty, rhythmic, dancey, arty, crafty. I’ll be helping running the arts and crafts activities on the day – we’ll be making wayang, puppets. You can BYO kid, borrow someone else’s, or bring yourself and other grown ups. 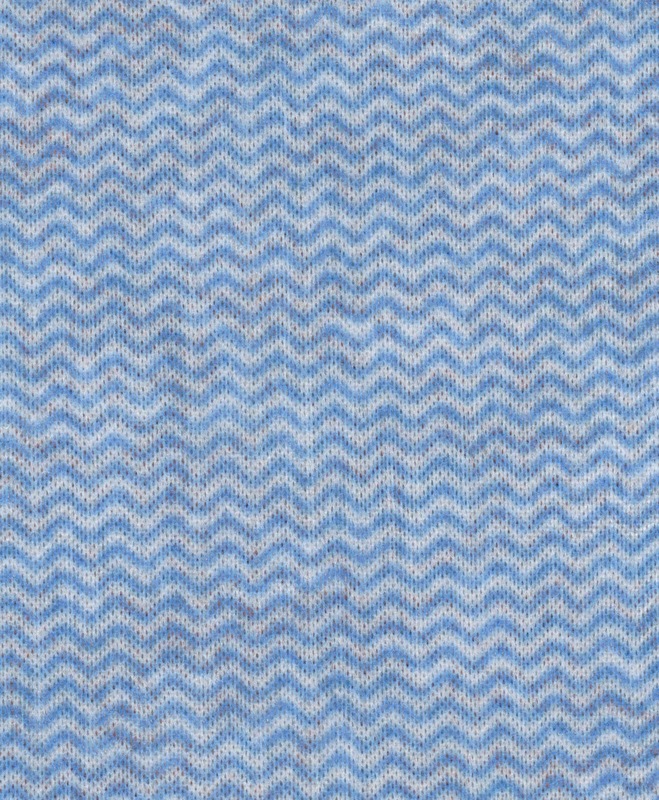 ASYIK! 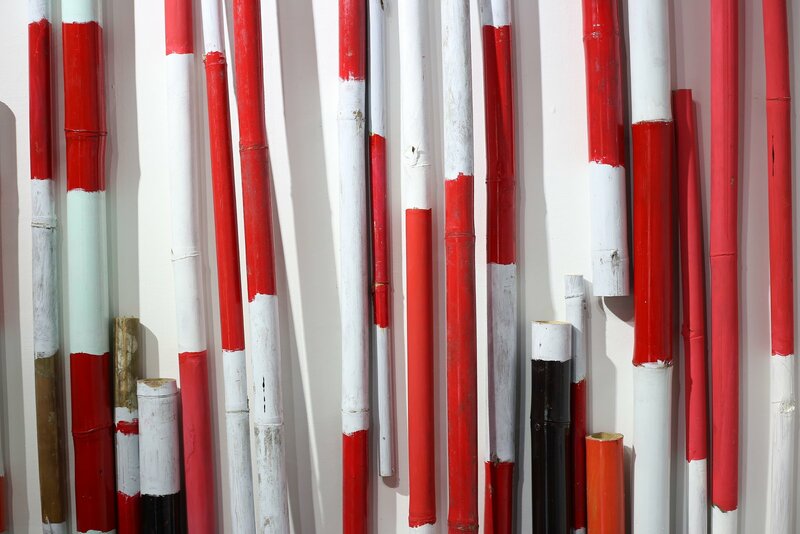 My studio – The Demountable – will be open over the weekend for LOST. Come visit! 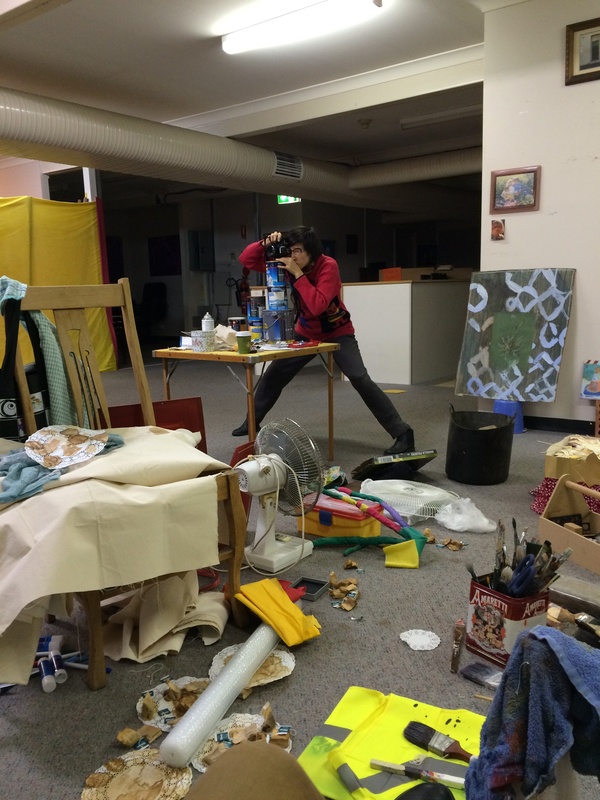 I have been selected as one of four artists to undertake a residency with Leichhardt Council’s The Demountable Subsidised Studio Space Program. 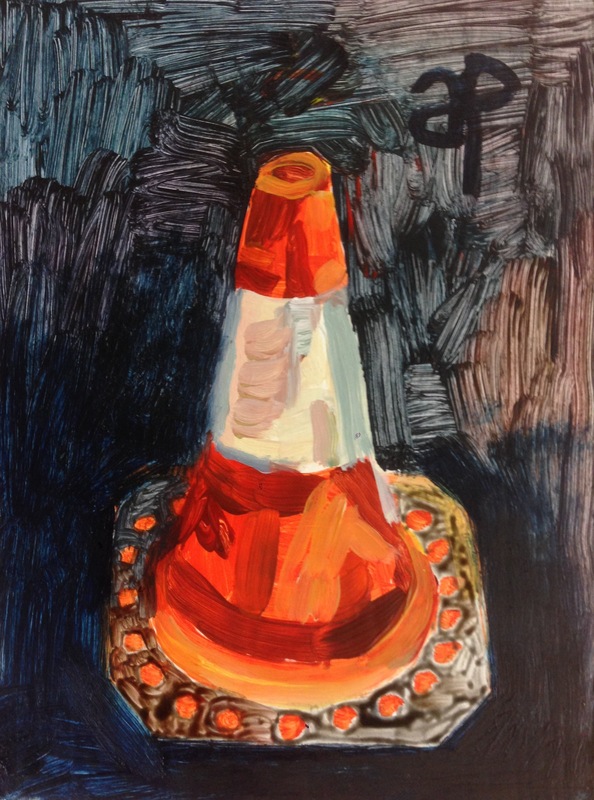 Read Fleur MacDonald’s little write up of my solo exhibition bloody woop woop / (n)desa: stories from Barmedman, Kliwonan and between on her blog SIX TO EIGHT. It’s nice.